Better than Before answers that question. It presents a practical, concrete framework to allow readers to understand their habits—and to change them for good. Infused with Rubin's compelling voice, rigorous research, and easy humor, and packed with vivid stories of lives transformed, Better than Before explains the (sometimes counter-intuitive) core principles of habit formation. • Sometimes I can change a habit overnight, and sometimes I can't change a habit, no matter how hard I try. Why? • Why can I keep habits that benefit others, but can't make habits that are just for me? Whether readers want to get more sleep, stop checking their devices, maintain a healthy weight, or finish an important project, habits make change possible. 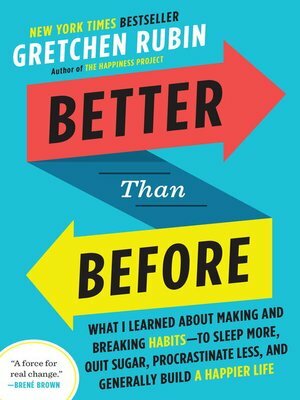 Reading just a few chapters of Better Than Before will make readers eager to start work on their own habits—even before they've finished the book.